Dr Amy Tang is a Brisbane-based female Gynaecologist and Certified Gynaecological Oncologist specialising in the management of both invasive and pre-invasive diseases of the female genital tract. Dr Tang uses the latest, evidence-based, clinically-proven techniques in the surgical treatment of women with ovarian cancer, cervical cancer, endometrial cancer, vulval cancer, and vaginal cancer to ensure the best outcomes for her patients. Whenever possible, Dr Amy Tang uses the most up-to-date techniques in laparoscopic (keyhole) surgery in order to achieve the best possible outcomes for her patients. Her patients experience a shorter hospital stay, a much shorter recovery time, and a better cosmetic result. Dr Amy Tang is an expert colposcopist in Brisbane with full accreditation by the Royal Australian and New Zealand College of Obstetricians and Gynaecologists (RANZCOG). Dr Tang has extensive experience in colposcopy. Prior to opening her private practice in Brisbane, she was a gynaecological oncology consultant staff specialist at the Royal Prince Alfred (RPA) Hospital in Sydney, where she was responsible for supervising and teaching junior gynaecologists in performing colposcopy. Dr Tang also currently works part time at the Royal Brisbane and Women’s Hospital as a specialist gynaecological oncology consultant. Dr Amy Tang completed her medical degree at The University of Queensland in 1999. 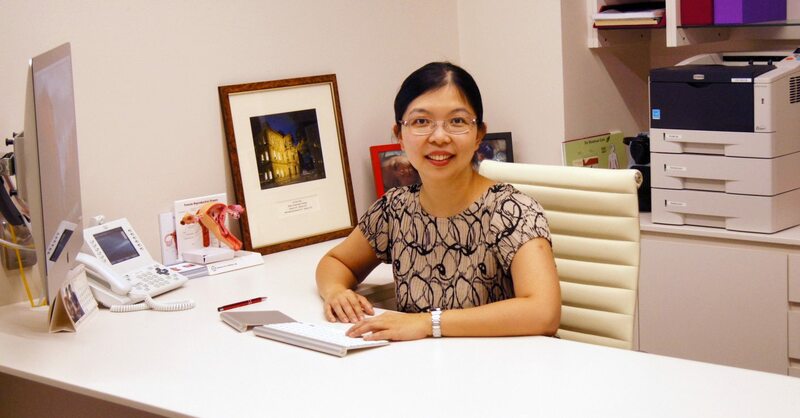 During her training years, she gained invaluable experience working in various hospitals in Queensland, as well as major teaching hospitals nationally and internationally, including Sydney, Perth and Hong Kong. In 2007, she was appointed Clinical Assistant Professor at the University of Hong Kong, working in the Gynaecological Oncology Unit of Queen Mary Hospital. She obtained extensive experience in this busy tertiary referral centre performing open, laparoscopic, and robotically assisted Gynaecological Oncology surgeries. She is a sub-specialist Gynaecological Oncologist, as certified by the Royal Australian and New Zealand College of Obstetricians and Gynaecologists (RANZCOG). She has publications in various respected peer-reviewed medical Journals, and has spoken at various national and international meetings on gynaecological oncology. Dr Amy Tang has a passion for teaching, and she is a clinical teacher for medical students at The University of Queensland. She is a member of the Australian Society for Gynaecologic Oncologists, and a member of the Queensland Centre for Gynaecological Cancer. Additionally, Dr Tang is trilingual; she is also fluent in Cantonese and Mandarin. A Gynaecological Oncologist is a gynaecologist who sub-specialises in treating cancers of the female reproductive system – ovarian cancer, cervical cancer, uterine cancer, vaginal cancer and vulval cancer. After 6 years of general Obstetrics and Gynaecology training to become a specialist Obstetrician and Gynaecologist, these sub-specialists undertake at least an additional 3 years of training in cancer surgery and management. This includes training in advanced surgical skills in performing both open and laparoscopic (keyhole) surgery. It involves experience not only in pelvic surgery, but also surgery related to the bowel, urinary tract and the upper abdomen. Dr Amy Tang is a female Gynaecological Oncologist who has undertaken this extensive and intensive training, with experience attained nationally and internationally. She is a Certified Gynaecological Oncologist of the Royal Australian and New Zealand College of Obstetricians and Gynaecologist (RANZCOG). Dr Amy Tang brings the skills she has obtained locally, nationally and internationally back to her hometown of Brisbane, with the aim of giving her patients the most comprehensive, evidence-based holistic care. Female Gynaecologist Dr Amy Tang is a trusted gentle Gynaecologist and Gynaecological Oncologist in Brisbane. As a female gynaecologist in Brisbane, she understands women’s needs and delivers compassionate care for her patients. As a gynaecological oncology sub-specialist in Brisbane, she is able to provide unique and comprehensive care to her patients. Being a sub-specialist Gynaecological Oncologist, Dr Amy Tang is an advocate for prevention and early detection of pre-cancerous conditions in women. Dr Amy Tang is a Brisbane Colposcopy specialist with extensive experience in the investigation and management of abnormal Pap smears, which are very important in the fight against cervical cancer. Gynaecologist Dr Amy Tang specialises in treating women with complex Gynaecological problems requiring advanced laparoscopic surgery. This includes laparoscopic hysterectomy for endometrial cancer and cervical cancer, as well as benign conditions such as fibroid uterus and endometriosis. Salpingo-oophorectomy is the medical terminology for removal of the ovaries and Fallopian tubes. This is usually done through keyhole surgery (laparoscopy). Gynaecological oncologist Dr Amy Tang has special interests in the prevention of ovarian cancer. She offers prophylactic surgery for women with the BRCA gene mutation who are at increased risk for ovarian cancer. As a Brisbane gynaecological oncologist, Dr Amy Tang has vast experience in managing ovarian cysts and pelvic masses. Many ovarian cysts are benign, however some of them are cancerous or malignant. Women with undifferentiated ovarian cysts can be cared for by a gynaecological oncologist who can remove these ovarian cysts using the most appropriate technique, depending on her expert assessment as a cancer specialist of the malignancy potential of the ovarian cyst. procedures please use the button below. staff will call you back to arrange and confirm your appointment.